Friend of the project, Rachel, spent some time in Israel and introduced us to one of her favorite dishes. Shakshuka is a Middle Eastern tomato stew with eggs. 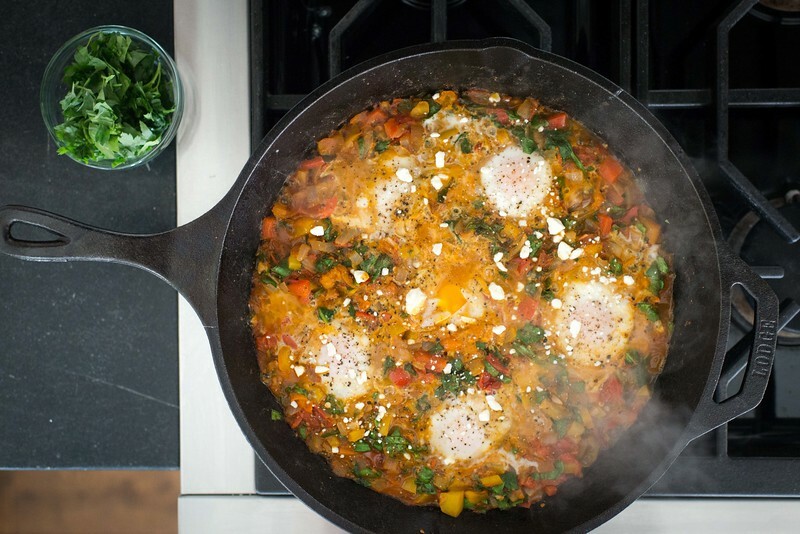 Here at the Doctor Yum Project, we believe that eggs are a great vehicle for vegetables so we added spinach to a basic Shakshuka recipe. Any greens like kale, tatsoi, or swiss chard would be delicious too! This fresh and hearty dish is perfect for breakfast, brunch, or even dinner. Pair it with fruit or green salad and some crusty bread for an amazing meal. Heat olive oil in a large cast iron skillet. Add onion, bell pepper, garlic, spices, salt and pepper. Saute and stir frequently until vegetables have softened, about 10 minutes. Add chopped tomatoes and continue to saute until tomatoes break down, about an additional 10 minutes. Taste and adjust seasonings to your liking. Add in spinach and stir into tomato mixture. Using a wooden spoon, make 6 indentations or "wells" in the vegetables spaced out in the pan. Gently crack an egg into each well. Reduce heat and cover skillet, and cook on low until the eggs are set. Uncover and add fresh parsley, if desired. Serve warm with pita, challah, or crusty bread.